In this application protocol, we describe a protocol to generate highly purified and viable astrocytes from neonatal mouse brain tissue. Brain tissue from mice younger than P8 is dissociated into single-cell suspensions and astrocytes are then isolated using the Anti-ACSA-2 MicroBead Kit. The ACSA-2 antigen is expressed specifically on astrocytes in a pattern similar to GLAST, and serves as a specific marker for astrocytes in the central nervous system.1,2 The proportion of ACSA-2+ astrocytes in brain tissue differs according to mouse age and brain region used for cell isolation. PB buffer: Prepare a solution containing phosphate-buffered saline (PBS), pH 7.2, and 0.5% bovine serum albumin (BSA) by diluting MACS BSA Stock Solution (# 130-091-376) 1:20 with PBS. Keep buffer cold (2−8 °C). Degas buffer before use, as air bubbles could block the column. MACS Columns and MACS Separators: ACSA-2+ cells can be enriched by using MS or LS Columns or depleted with the use of LD Columns. Positive selection or depletion can also be performed by using the autoMACS® Pro Separator. ▲ Note: Column adapters are required to insert certain columns into the VarioMACS™ or SuperMACS™ II Separators. For details refer to the respective MACS Separator data sheet. Fluorochrome-conjugated Anti-ACSA-2 antibodies for flow cytometry analysis, e.g., Anti-ACSA-2-APC (# 130-102-315). Learn more about our antibodies and dyes. Adjust cell culture time to meet your experiment objectives. Prepare the following cell culture medium: MACS Neuro Medium containing 2% MACS NeuroBrew®-21, 1% penicillin/streptomycin and 0.5 mM L-glutamine. Use the Neural Tissue Dissociation Kit (P) or Neural Tissue Dissociation Kit (T) to dissociate brain tissue and prepare a single-cell suspension. Follow the protocol of the kit data sheet. The data sheet for the Neural Tissue Dissociation Kits includes a set of tips & hints to improve the quality and yield of the dissociation procedure. Refer to the data sheet appendix if, for example, the yield of viable cells is too low or a cell pellet will not form. Isolate the ACSA-2-positive astrocytes from the single-cell suspension using the Anti-ACSA-2 MicroBead Kit, mouse. Follow the protocol of the kit data sheet. The recommended antibody dilution for labeling cells is 1:10 for up to 1×10⁶ cells/50 μL of PB buffer. Volumes given below are for up to 1×10⁶ nucleated cells. When working with fewer than 1×10⁶ cells, use the same volumes as indicated. When working with higher cell numbers, scale up all reagent volumes and total volumes accordingly (e.g., for 2×10⁶ nucleated cells, use twice the volume of all indicated reagent volumes and total volumes). Use 100 μL of the ACSA-2+ fraction for analysis. Optionally, also analyze 100 μl of the negative fraction and 20 μL of the original fraction. Resuspend up to 1×10⁶ nucleated cells per 45 μL of PB buffer (see "Things to prepare in advance of cell isolation and cell culture"). ▲ Note: Always use freshly prepared buffer. Add 5 μL of Anti-ACSA-2-APC, mouse antibodies. Mix well and incubate for 10 minutes in the refrigerator (2−8 °C) in the dark. ▲ Note: Higher temperatures and/or longer incubation times may lead to non-specific cell labeling. Working on ice requires increased incubation times. Wash cells by adding 1 mL of PB buffer and centrifuge at 300×g for 10 minutes. Aspirate supernatant completely. Resuspend cell pellet in a suitable amount of PB buffer for analysis by flow cytometry, e.g., using the MACSQuant® Analyzer 10. Plate 5×104 cells in 50 μL of pre-warmed prepared medium as a drop in the middle of each well of a coated 24-well plate (see "Things to prepare in advance of cell isolation and cell culture"). Carefully add 450 μL of prepared medium to each well. Maintain the culture by replacing 50% of medium every other day. Add primary antibody in staining buffer to the cells with a final concentration of 1–5 μg/mL and incubate at room temperature in the dark for 10 minutes. Add a corresponding secondary antibody in staining buffer to the cells and incubate at room temperature in the dark for 10 minutes. 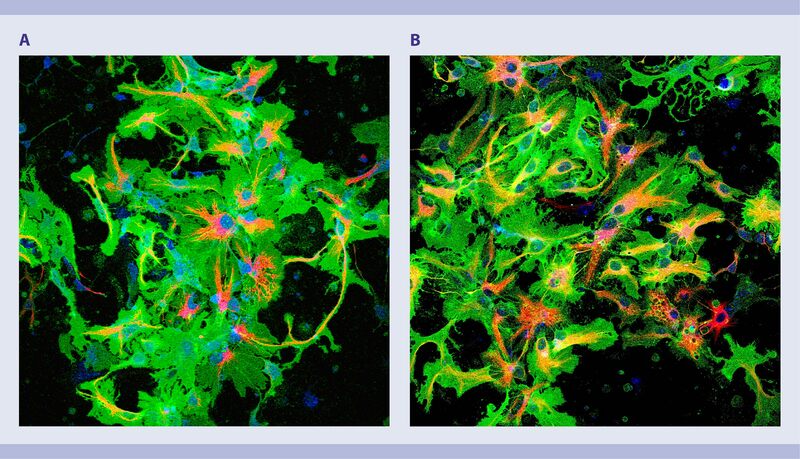 Successful culture of ACSA-2-positive astrocytes isolated from neonatal mouse brain tissue. P3 whole mouse brains were dissociated using the Neural Tissue Dissociation Kit (P) and astrocytes were isolated from the single-cell suspension using the Anti-ACSA-2 MicroBead Kit. Astrocytes were cultured in MACS® Neuro Medium, MACS NeuroBrew®-21, 1% P/S, and 0.5 mM L-glutamine, on PLL-coated glass coverslips (5×104 cells per well). After 3 days in culture, isolated astrocytes were fixed and stained with the astrocyte-specific antibodies Anti-GLAST (green) and Anti-GFAP (red). P3 whole mouse brains were dissociated using the Neural Tissue Dissociation Kit (P) and astrocytes were isolated from the single-cell suspension using the Anti-ACSA-2 MicroBead Kit. Astrocytes were cultured in MACS Neuro Medium, MACS NeuroBrew-21, 1% P/S, and 0.5 mM L-glutamine, on PLL-coated glass coverslips. After 3 days in culture, isolated astrocytes were fixed and stained with the astrocyte-specific antibodies Anti-GLAST (green) and Anti-GFAP (red). G. Kantzer, C. et al. (2017) Glia 65: 990–1004.